Flashing thermometer, displays the temperature in negabinary on a bi-colour LED. 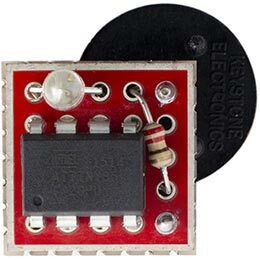 The thermometer consists of just an ATtiny85 and a bi-colour LED, using the sensor in the ATtiny85 to measure the temperature, and to avoid the need for a digital display the thermometer pulses the temperature as a series of flashes on the bi-colour LED, green for a zero and red for a one. I designed it so I could seal it in a small plastic bag and put it outside the window, allowing me to see the outside temperature from inside. 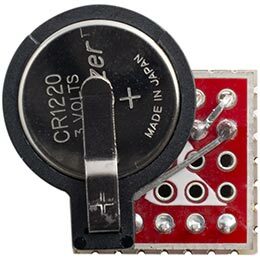 It incorporates several power-saving features to enable it to run for two years on a pair of 1.5V AAA cells, or half a year on a CR2032 button cell. For a similar project based on an ATtiny10 see ATtiny10 Thermometer. The thermometer displays the temperature in a little-known notation called negabinary, which is ideal for this application; if you prefer you could easily modify the program to use a more conventional notation, such as signed binary, or even morse code. It flashes the digits starting with the most significant negabinary digit, so the first flash will always be red, unless the temperature is zero in which case it gives a single green flash. Multiply your total by -2. Add the value of the digit (green=0 or red=1) to your total. When there are no more digits your total is the decimal value of the number. Circuit of the flashing thermometer. For the LED I chose an ultra-bright red/green bicolour LED from Kingbright, which is still clearly visible with a very short pulse duration . Alternatively you could use separate red and green LEDs. Reverse of the flashing thermometer, showing the button cell holder. The way this works is quite obscure; there's an explanation in Hacker's Delight . It uses the variable show to suppress leading zeroes unless the number is zero, in which case it gives a single green flash. The thermometer uses the following features, in order of importance, to reduce the power consumption and ensure that it will last as long as possible on a single battery. Most of the power is consumed by the LEDs. I chose a high brightness two-colour LED so it would be visible even with very short pulse durations. It's only on for 12msec, but is still clearly visible. Whenever the thermometer is not measuring or displaying the temperature it puts the ATtiny85 to sleep, reducing the power consumption to 0.2µA. The processor sleeps for 16 seconds between each display of temperature, for 1 second between each flash, and for 12msec during each flash. In each case the processor is woken from sleep using the watchdog timer, which generates a watchdog timer interrupt after a specified delay. This enables the watchdog timer, and the parameter n sets the watchdog timer prescaler. A value of 0 gives a 16 millisecond delay, and a value of 9 gives an 8 second delay. These features combine to reduce the average power consumption to 0.05mA, which is equivalent to about 180 days for a CR2032 button cell with a capacity of 225mAH. I also tried reducing the processor speed, using the system clock prescaler, but this had a negligible effect on the power, presumably because the processor spends most of the time asleep. Here's the whole Flashing Thermometer program: Flashing Thermometer Program. 7th January 2019: I've updated the description to recommend using Spence Konde's ATTiny Core, and I've added an explanation of the order in which the digits are flashed. ^ Kingbright L-93WSURKCGKC LED on Farnell. ^ Warren Jr., Henry S. (2013) . Hacker's Delight (2 ed.). Addison Wesley - Pearson Education, Inc., p. 305-306.